If you live on a golf course, you've probably had to deal with broken windows. Invisi-Net is your solution. 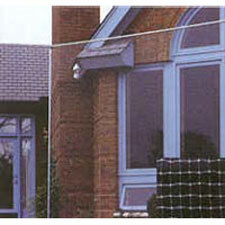 Virtually invisible protective netting that provides safety and protection for your family, home, and checkbook. Can be installed in a variety of ways, including steel or wood poles, between two trees, or from your awning. The most popular protective netting available for homeowners. This is not "practice" netting for hitting balls at close range, it is for "protective" purposes only. Sold 12' wide (when Stretched) by a minimum 12' length, and up to 150 feet long. Minimum order is 12' wide by 12' long.